* A desk to meet the highest demands. * With wheels for easy moveable. * Rotating board,full angle for comfortable using. * 360 degree rotation and the height is so easy to adjust. * Perfect for storing books and other office supplies. * Long-lasting and durable, and will look great for years to come. * Made of high quality material, the desk is extremely durable and super strong. * Adjustable mobile computer desk, space saving. * High stability and great workmanship. * It should be personalized to your needs. 【STYLISH DESIGN】Make up of Carbon Steel + High-Density Sheet + A Metal Base make this desk sturdy enough to support up to 20 lbs, and the modern conception will easily match with most décor styles. 【ADJUSTABLE HEIGHT】Regulate the desk height from 24"-35" so you can use as a sitting work desk or a standing one, depending on your working needs and reduce muscle pain in your neck and back by by adjusting the height correctly. 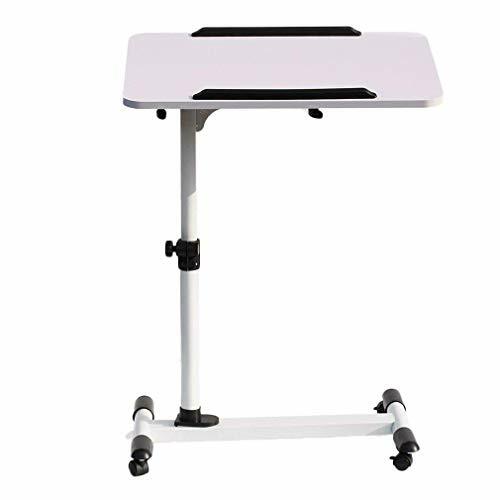 【ROLLING DESK】4 wheels make this workstation easy to move from room to room; it handily adapts to different usages such as a standing desk, a table to write, to work on your laptop, watch movies, or present project presentations at work. 【TILTING WORKSTATION】The panels can be tilted individually up to 180° by using the manual knobs beneath the desktop; 2 Safety edge-stopper to prevent objects from sliding off when the panel is tilted, like your laptop or pen. 【INTIMATE AFTER-SALES SERVICE】Easy to assembly and delivered with instruction manual, set of screws and all necessary tools. 100% refund & warranty guarantee. Note: The board needs to be assembled.